QCA Spas Hydro-Pure System keeps spa water crystal clear. Spa sanitation can be frustrating and time consuming. QCA Spas' exclusive Hydro-Pure System makes spa sanitation simple, so you can spend time enjoying your spa and less time maintaining it. 1) 100 sq. ft. filters that are capable of filtering a 15,000 gallon swimming pool can easily filter out dirt and organic waste from a 500 gallon spa. 2) The built-in chemical dispenser automatically dispenses the correct amount of sanitizer into your spa water. 3) The spa's inline heater with smart sensor technology regulates water flow and water temperature for effective sanitation and spa safety. 4) The spa's Hi-Flow pumps are capable of cycling 500 gallons of spa water through the sanitation system in as little as two minutes. 5) The spa's corona discharge ozone unit is activated during the filtration cycles and heating cycles. Ozone sanitizer is injected directly into the spa's waterline and then distributed into the spa's main body of water. 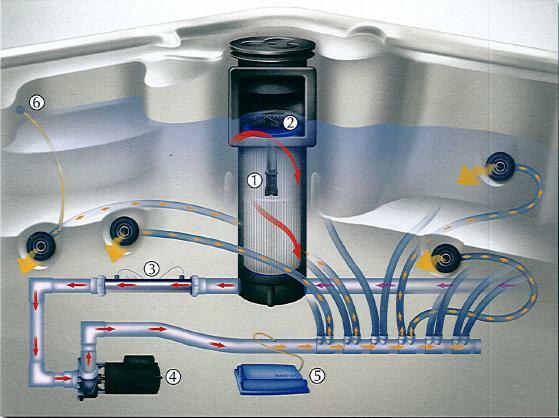 6) The ozone recovery system captures unused ozone that rises out from the top of the spa's water, then redistributes it back through the waterlines and into the spa's main body of water. This process keeps ozone from destroying your hard cover.